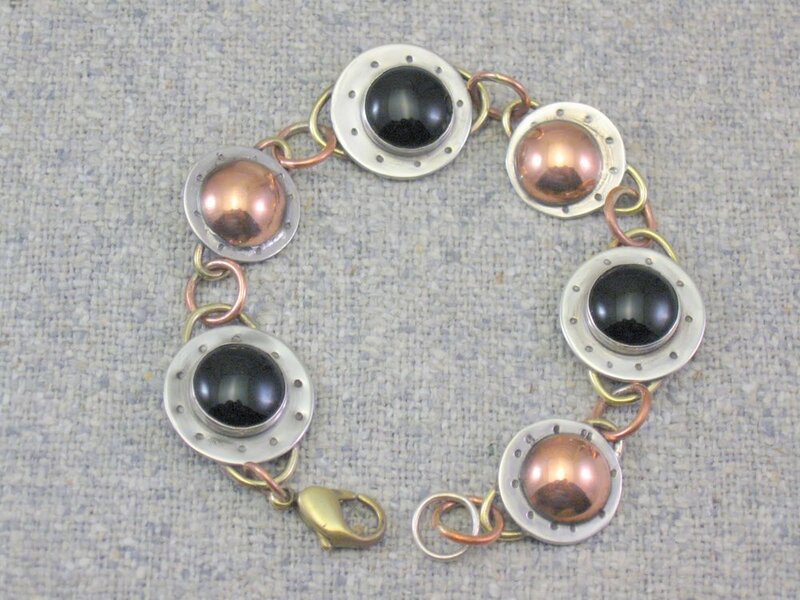 one of a kind mixed metal art piece. themes may vary and each is unique with some input from you. 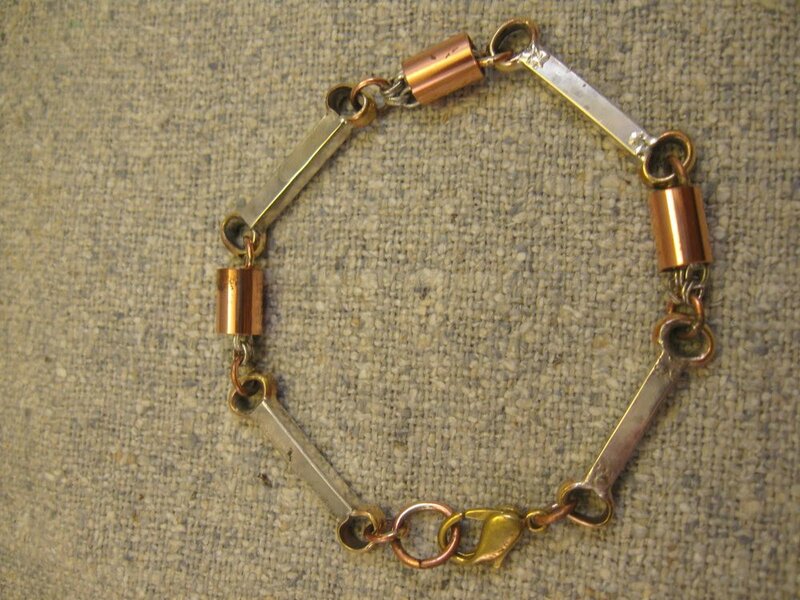 this bracelet usually has 8 pieces measuring about 7/8" square joined with custom hinges, a 3-D heart box in center, assorted semi precious stones, charms, a special latch clasp and a safety chain. brass, copper, 1 1/4" sterling disk. decorated hearts. 7+". 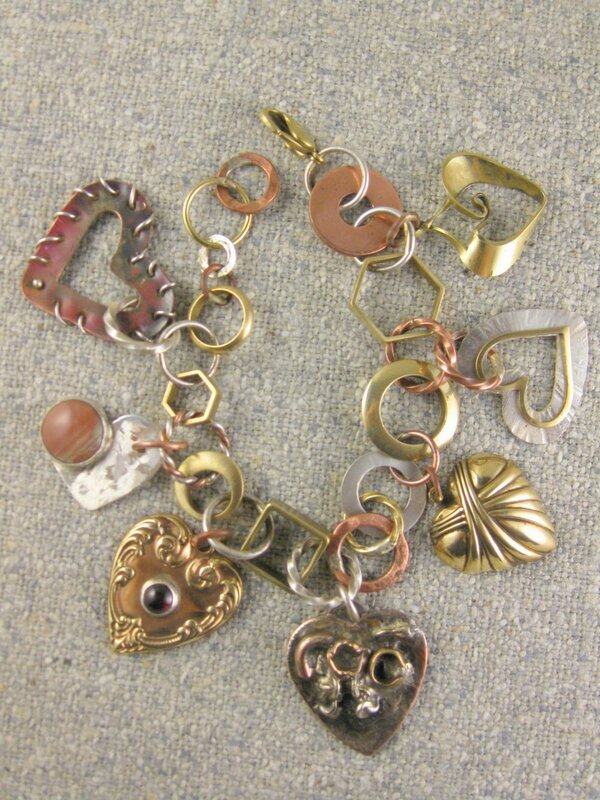 handmade mixed metal chain with one of a kind "painted' heart charm. 7+". linked 5/8" sterling squares with mixed metal rivet shapes, semi precious stones and toggle clasp. 7+". sterling rectangles, semi precious stones, copper, brass connectors. 7". 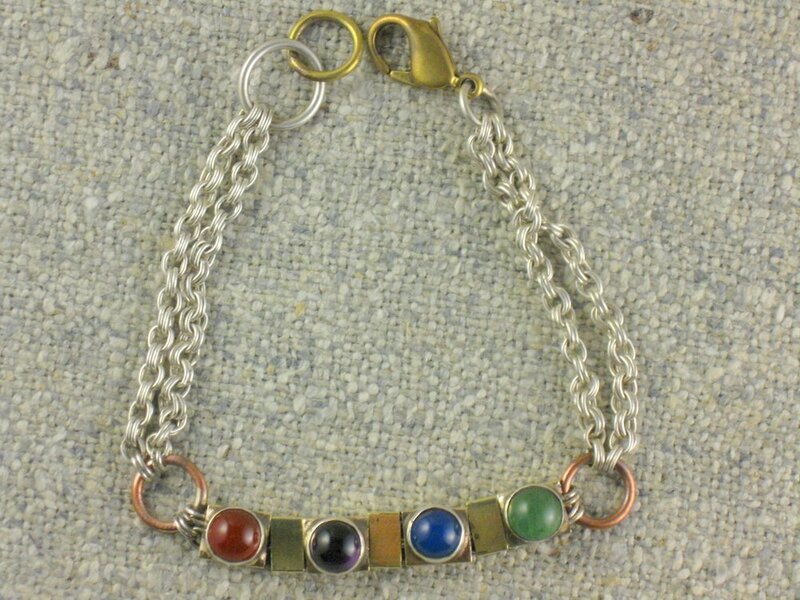 handmade mixed metal chain with 1 1/4" sterling disc enhanced with copper dome and semi precious stone. 7+". 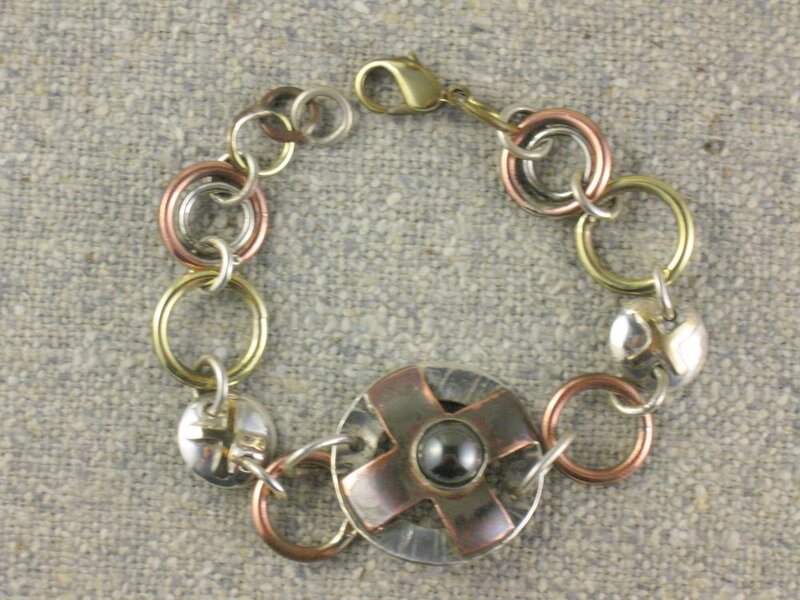 sterling, brass, copper, semi precious stone. 7+". 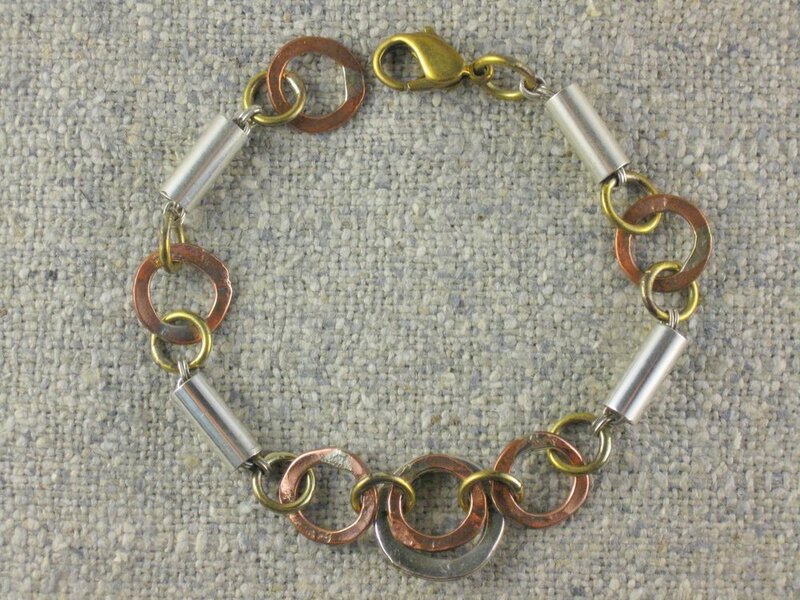 copper, brass, and sterling. 7". 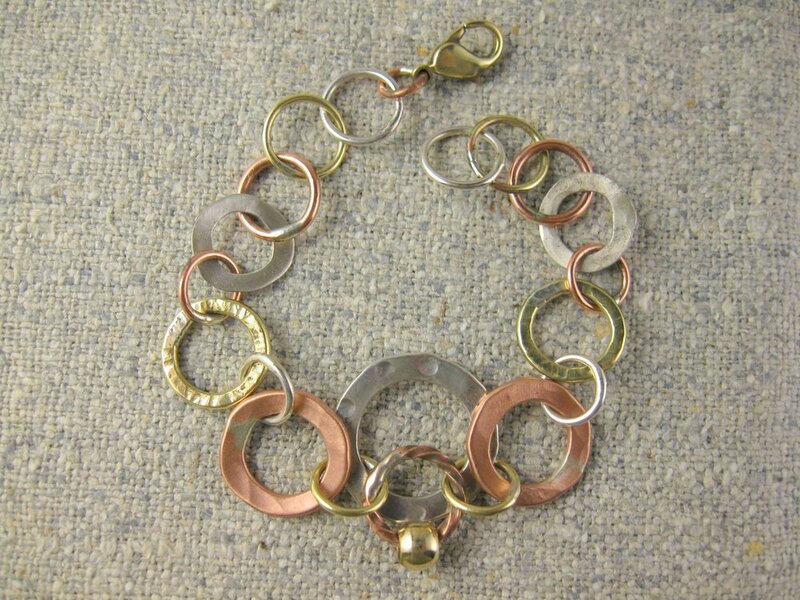 handmade mixed metal chain. copper, sterling, brass. 7+". sterling silver shapes with semi precious stones separated by brass beads strung on strong sterling chain. 7". silver disks, copper domes, onyx. larger disk is 7/8" diameter. 7" length. mixed metal. sterling back plate measures 3/4" x 1 7/8". small sterling dome between 2 semi precious stones on copper top plate. 7+" length. 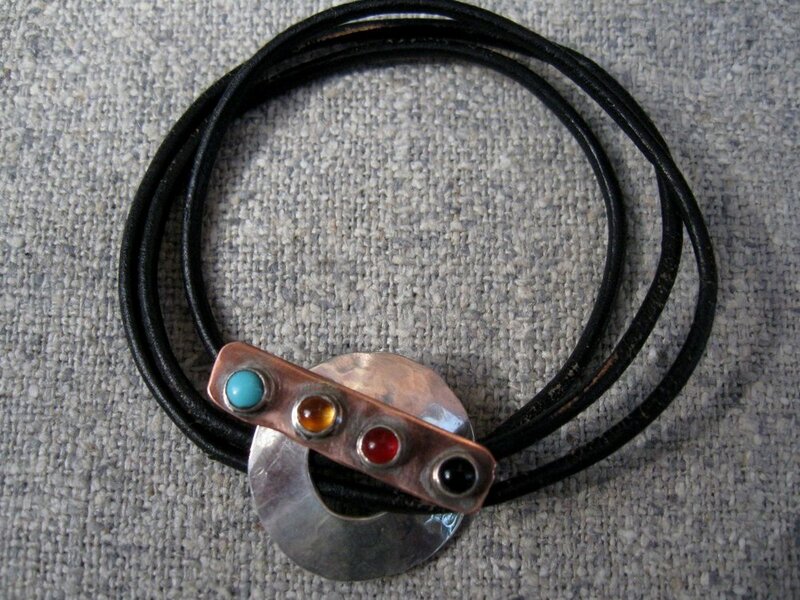 1" hammered sterling circle with off center hole through which to thread leather and copper toggle with 4 semi precious stones. leather roughly 21". 1/4" brass squares with semi-precious stones, sterling chain. 7". sterling heart, semi precious stone, mixed metal rings. heart is about 1 1/2" square. 7". sterling bars, copper tubing and brass connectors. 7+". sterling tubing, mixed metal links. 7+". hand formed sterling links. center large link can be either an oval or a circle. 7+". 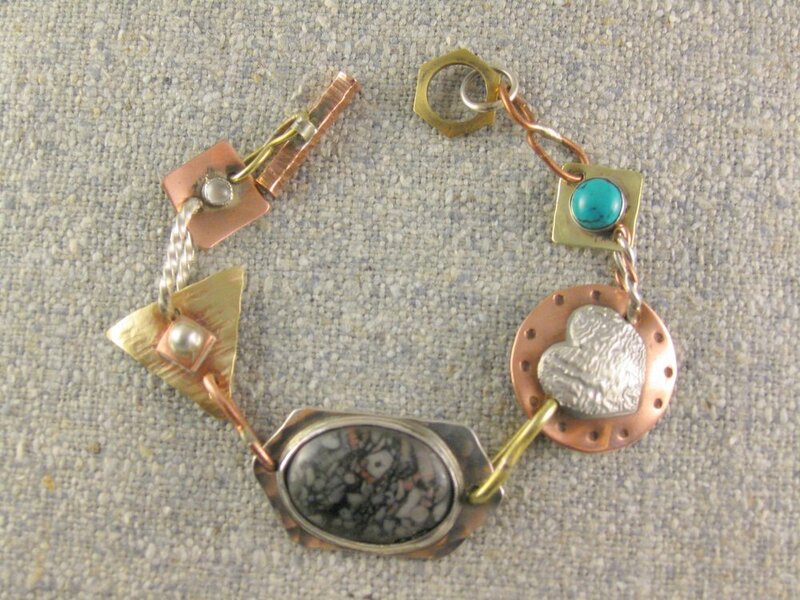 assorted shapes, stones, and metals. funky fun. 7+". 6 sterling hammered squares, 3/4" each. copper domes, copper bezels, onyx, brass connections. approx 7". substantial yet light and comfortable to wear.